The Austrian conductor Christoph Campestrini is defined by the rich musical tradition of his home country and the cosmopolitan education that he received during his formative years in New York. He studied conducting, composition, philosophy and languages at The Juilliard School and at Yale University. Christoph Campestrini now maintains an active worldwide conducting schedule, having appeared with the London Symphony Orchestra, Moscow Radio Symphony Orchestra, Deutsches Symphonie-Orchester Berlin, Frankfurt Radio Symphony, Mozarteumorchester Salzburg, Vienna Radio Symphony, Orchestre National du Capitol de Toulouse, Real Orquesta Sinfonica de Sevilla, Prague Radio Symphony, Budapest Radio Symphony, National Symphony Orchestra of Mexico, Cairo Symphony Orchestra, Seoul Philharmonic, National Symphony Orchestra of Taiwan and many more. 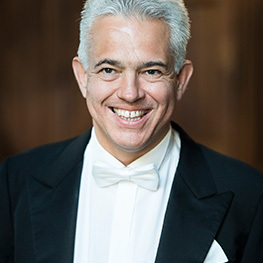 In 2016 Christoph Campestrini was appointed Kapellmeister at the prestigious Wiener Hofmusikkapelle. There he will conduct the Vienna Philharmonic, Vienna Boychoir and Male Choir of the Vienna State Opera in seven programs of sacred music annuallly. In addition he is also Music Director of the International Late Summer Music Festival Dubrovnik and Music Director of the Oper Klosterneuburg Festival Vienna, where his most recent production of "Cavalleria rusticana"/ "I Pagliacci" has earned accolades of praise by the Vienna press. Every season he is also a regular guest conductor in the United States and Canada, where he has worked with The Philadelphia Orchestra, Houston Symphony, Detroit Symphony, Indianapolis Symphony, Florida Orchestra, Vancouver Symphony, National Arts Centre Orchestra Ottawa, Orchestre Symphonique de Quebec and many others. Christoph Campestrini is equally in demand as an accomplished opera conductor. At the well-known Essen Aalto Musiktheater he served as 1.Kapellmeister (Principal Conductor), leading over 100 performances of various repertoire. He has also appeared at the Teatro Regio Torino, Teatro Lirico Cagliari, Deutsche Oper am Rhein, Minnesota Opera, Opera de Montreal, Edmonton Opera and the Sakai City Opera Osaka in Japan. Among the international soloists he has collaborated with are Lang Lang, Gidon Kremer, Julian Rachlin, Alisa Weilerstein and Julia Fischer. When not conducting he enjoys composing Lieder cycles, chamber and symphonic music - and he is also a fervent admirer of literature and languages. In addition to German he speaks English, Italian, French, Russian and Spanish. Upcoming engagements for 2016 include the Orchestre Metropolitain Montreal with which he enjoys a close relationship, Orquesta Filarmonica de Gran Canaria, Orchestre Philharmonique Royal de Liege, Beethoven`s Ninth with the Texas Festival Orchestra Round Top, a Viennese New Year`s Concert in Toronto and the Warsaw Radio Symphony Orchestra.